My back legs dont work so well these days. One of them is a bit sore and doesnt want to move as well as the other ones, so I drag my toes a bit. This has caused my pawnails to be very short and sometimes red stuff comes out. During our walk it wouldnt stop coming out. So mommy came home, cleaned it up and then put hooman clothes on me again. I still dont get it, but I do know mommy is loving me. Note from mommy: I am getting more and more concerned about Sasha's back leg. We hesitate going the vet route, as we know it is going to be a lot of expenses. She is almost 10, old for a big gal, but besides her leg, she is still going fine. And it doesnt seem to slow her down. I am sure she has arthritis or the signs of hip dysplasia. When we run, she just keeps her back legs together and does sort of a jump, which seems to be more comfortable for her, than just walking. That leg sort of twists when she walks, almost like a bow-legged cowboy. Just yesterday I heard a clicking sound, which terrified me. I am not ready to lose her. I have made her walks shorter and shorter, however her leg seems to drag more, causing the nails to be filed to the quick on the sidewalks. I wonder is there is such a thing as a "nail cover"? Has anyone heard of them? I am also wondering if getting the boots that the snow doggies have, would work? The sock doesnt stay on very well, when we leave the house. Does any other doggie mamma's have opionions? With me out of work, we hesitate toward the expensive route right now. Not prepared to make a touch decision yet. Oh, poor Sasha. It does sound like she has something going on with either her hip or her lower back. It might be worth a trip to the vet and some diagnostics (at least xrays) to see if there is arthritis or hip dysplasia going on. At 10 years old I probably wouldnt do anything invasive (i.e surgery) to correct the problem, but maybe some anti-inflammatories would help. Another thing that helped a previous dane of mine tremendously was accunpuncture. She loved it and it made her feel SO much better! Poor Sasha, You are very lucky to have such a caring Mom. Our Sasha is also having a bit of a problem with her backend. Our Sasha is almost 10. Mom has been taking her on shorter walks too. It is so hard as they get older and having aches & pains. 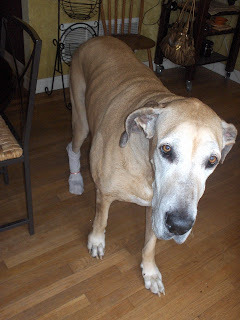 Maybe the dog boots/shoes will help keep her toenails for hurting so much. We will keep good thoughts. They do come in bigger sizes too. I have to agree with what everyone else said - I do think it's worth a trip to the vet. It's more likely to be arthritis than anything else "bad" and that is very treatable - just a course of anti-inflammatories can make a huge difference and as others have said, there are also other treatments. I don't think your vet is going to recommend anything drastic if it is arthritis or other similar chronic problem but they will be able to give Sasha some treatment that will significantly improve her quality of life. I think if it was just slightly sore, then I would also just leave it and see but in this case, it seems serious enough to cause her to walk funny and hurt her nails, etc, so not really something to ignore, I think! I can totally understand about the financial side of things but actually, I think that the booties, etc, you're looking for will cost quite a bit too (is there ANYthing for our giant breeds that doesn't cost the earth?!) and you may find that they cost about the same as giving her anti-inflammatories or similar treatment, which would do more to relieve her pain and discomfort. At least, it would be good to get a diagnosis and to 'know' - and then you can decide on the best next steps whereas at the moment, you're sort of groping in the dark, which is horrible for you too. When I hurt my leggie, my vet did a special test to see if I could turn my toes back over. She said it could tell if I had the nuro logicals or mechanical problems. I was lucky because I passed, but it was good to find out and know. Ten years old is impressive. You take good care of yourself and listen to what your mommy says. Don't be brave, either, OK? 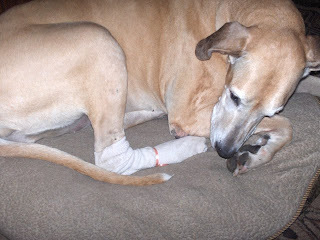 Sometimes us doggies don't like to tell our people how much something hurts. But you have to let her know if your ouchie is bad. Oh, Sasha, sometimes life is so hard and getting old can be a bummer. But your mom is taking good care of you and doing her best to help you. WOW! You know you don't look a day over 3! You are so sassy and vivacious! I think some things like glucosamine and chondroitin might make you feel very fine and dandy again. When Mr Darcy started to have his problems his back legs were scraping a lot too. Once an entire claw came right off! There is a kind of bandage that you can buy and it is stretchy and krinkly and sticks to itself (but I can't remember what its called) anyway it is great stuff! You can wrap it around her back feet and it will stay on quite well. There are lots of places that sell doggie booties, but you could probably make your own cheaper. Just go to your local fabric store and buy some thick, fleecy material and some iron-on velcro. 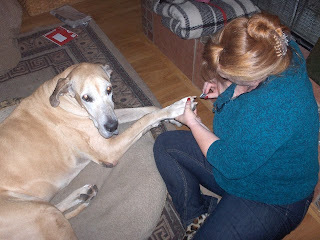 If Sasha drags her paw a lot she might go through several, so it might be more cost conscious to make your own. You could also buy some "pleather" type fabric that would be more durable. Oh no Sasha...I'm so so sorry you back end is not doing too well. I do not look forward to that day when I'm not walking well...you know I'm like you an older gal and mom will just be beside herself if something happens to my stilts (as she calls them). Mom says to let you just be lazy and not to have to go on long walkies so you can ease the pain. Do you have any less expensive vets where you live? I know of some places out where we live that people can take their dogs and it doesn't cost as much. You have to wait and wait and wait and you never know what vet you will get. I've never been there but a friend of mom's goes to this place cuz it's less expensive so maybe check that out in your area. You should definitely get to the vet for a look see. Also, will you wear booties? They may help you with the traction for getting up and standing. If you will wear them, email my mom at deniselewand@hotmail.com and she will send you my booties so you can try them out and use them. No need to spend money you can just have mine if you want them. I want to help you out. They don't fit perfectly but serve the purpose and once I got used to them I was ready to roll. Keep me posted and hope you feel better soon. AARF Kasha the Dainty Great Dane.